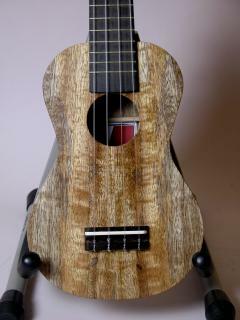 "I have played many ukuleles in my time, but none as fine as my Mya Moe. 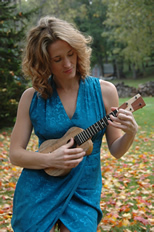 The soprano Mya Moe has a tone and timbre that I haven't heard on a uke before; the sound is light but rich, and it has a strong presence when I play in a group. This instrument has made me a more prolific songwriter, a more tasteful arranger, and a happier person." Emily Hurd does not craft tunes for the faint of heart. With the vocal beauty of Shawn Colvin, the lyrical depth of Bob Dylan, and the piano delivery of Vince Guaraldi, Hurd has been hailed as the answer to the cookie cutter pop artist. Well-traveled and well-versed, she is the quintessential indie national act, performing for growing pockets of loyal followers who revel in her clever rhymes and honest performance style. She has shared the stage with Bettye Lavette, Ozomatli, and Irma Thomas, to name a few, and has opened as a solo act for the likes of Roger McGuinn and Geoff Muldaur. Her song "The Likes Of You" was a winner in the 2008 Unisong International Songwriting Contest, and "Make a Bed" was a finalist in the 2008 John Lennon Songwriting Contest.